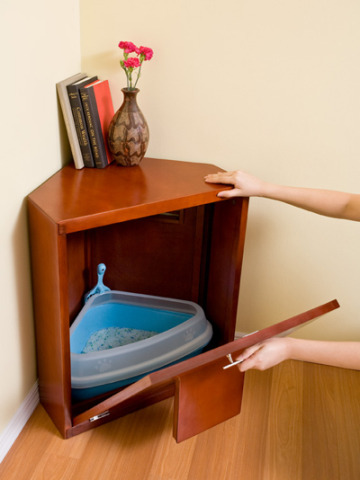 One of my favorite cat loving designers of cat furniture, The Refined Feline, has just come out with a really sharp Corner Litter Cabinet to match your decor and keep kitty's litter business discreetly away from your family and guests. 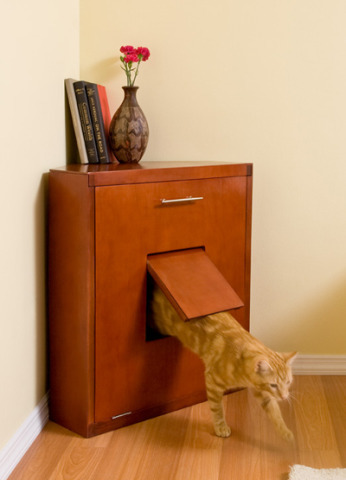 This Corner Litter Cabinet, available in honey, mahogany, and espresso finishes, is not only cat-friendly, it's human-friendly too. It's designed to open from the front handle to clean; nice and easy, so you don't have to crawl behind the unit. Inside is a large triangular litter tray, made to fit, with a neat litter scoop to hook on a corner. Note that the tray also has an outer 'catch tray' around it's rim for stray litter. And if you're worried about odor, the Corner Litter Cabinet has you covered with rear vents that provide for air flow and a place to hang a few odor absorbing filters (not included). Living quarters are tighter and tighter these days, and cats don't always have a room of their own to conduct their private business. Refined Feline has always kept this in mind in its clean-lined furniture that, in various finishes, blend in with most any living style.